Public Service Loan Forgiveness (PSLF) program, designed to provide financial aid to professionals working in the government sector or not-for-profit organizations, has found its place in the President’s fiscal year 2020 budget. The Trump administration has proposed eliminating the program in an effort to streamline the student-loan system. This is not the first time when the Trump administration has proposed such an action. The administrative authority floated a similar proposal in 2017 with no fruition. Let’s find out more about the PSLF program, and the impact its elimination could have on the American public. Public Service Loan Forgiveness program was initiated to offer financial aid for student debt repayments to professionals choosing low-paying critical government jobs such as firefighters, teachers, civil law representatives, and individuals working in the not-for-profit sector. PSLF program has strict eligibility requirements in terms of the nature of employment, length of employment, type of student loan, choice repayment plan, and 120 qualifying repayments. PSLF program is built to forgive only Direct loans, with an added benefit of tax-free forgiveness. 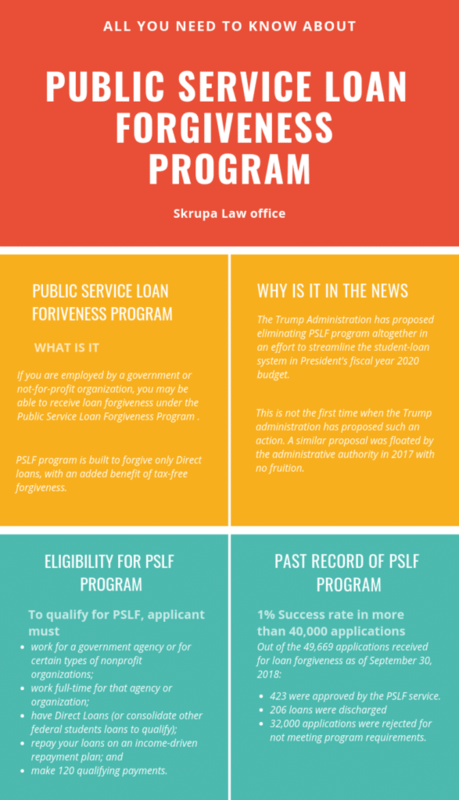 The proposal to eliminate the PSLF program by Trump’s administration is likely to be perceived critically by program beneficiaries as well as program supporters, especially considering its below 1% success rate. Out of the 49,669 applications received for loan forgiveness as of September 30, 2018, only 423 were approved by the PSLF service, and out of these, 206 loans were discharged. Student advocates have often called PSLF requirements too strict to fulfill, a fact confirmed by the rejection of over 32,000 applications for not meeting program requirements. Americans have a net student debt of over $1.5 trillion, and this move is nothing short of a setback for professionals working towards loan forgiveness. It is important to note that student loan is the second highest debt category in the U.S after mortgages. At least 44 million Americans have some student debt, with a default rate of roughly 10.7%. If the Trump administration is successful in getting the bill approved, it could be a huge discouragement for students aiming for government jobs or a career in non-profit organizations. As of now, the elimination of the PSLF program is only a part of the President’s budget, and according to experts, it is highly unlikely to make its way into enactment. Professionals seeking relief under the PSLF program should continue making repayments, and seek expert advice when required.